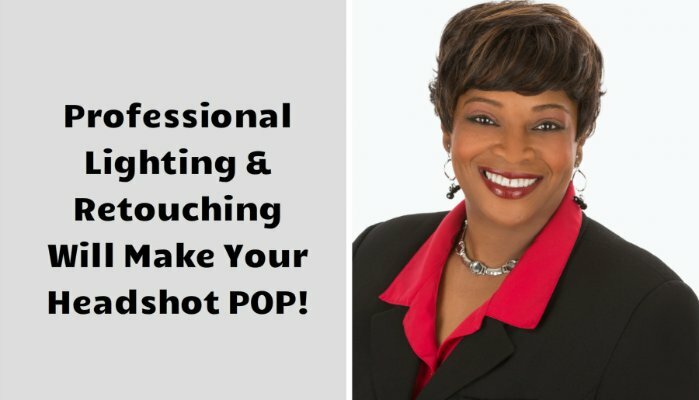 Professional Lighting And Retouching Will Make Your Headshot POP! It's interesting how many headshot clients are blown away in studio when they see the initial un-retouched images as I'm shooting. I believe that is because of 3 key things: 1) We are a cellphone camera society. Although cellphones often look great outside, inside images are usually not all that professional looking. 2) Professional Studio lighting makes a difference. 3) I'm shooting with a real camera and not a cellphone. It's not hard to beat cellphone shots inside with a quality camera and quality professional lens. To further drill home my point, the initial WOW! from the client is because our minds get so accustomed to seeing cellphone selfies and other cellphone images that when a quality studio shot is shown to someone it really stands out. Yes, that's what you'd expect when hiring a professional, but you and I both know that many people use cellphone images on their LinkedIn profile which most of the time is not a good idea. The second part beyond the professional lighting is the post production retouching. Many people refer to it as something like this "You're going to photoshop me a new _____ right?" because most people know that Photoshop is the software that will be used to enhance their final image(s). Lightroom is also used a lot, but most people that are not in the photo world will not mention Lightroom. No matter how great a photographer is, there are things that CANNOT, I REPEAT, CANNOT be done in camera. Any photographer that says, "I always get it right in camera and don't need post production work on my images" may only be focused on one thing that can be done mostly with good camera settings and a great lens. However, when it comes to headshots there are things like a slight wrinkle in a jacket or shirt that happens no matter how hard you try, a small fly away hair that got missed when the subject turned slightly or outside due to slight wind, facial lines, neck lines, crows feet under the eyes, pimple(s), skin blemishes, whiter teeth and more are things that the photographer cannot just do in camera no matter how great the photographer is. There are definitely limits to what can be done in camera which is why post production editing/retouching is so important.